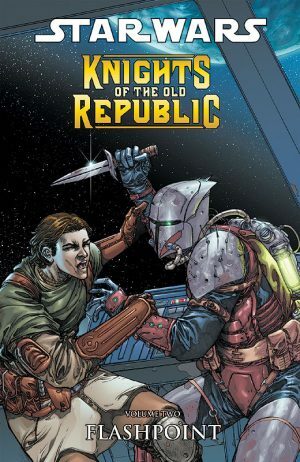 All Knights of the Old Republic stories take place after a definitive victory for the Jedi against the Sith, but true peace isn’t on the agenda as the Republic rapidly became involved in a war with the Mandalorians, and War begins on the front line. 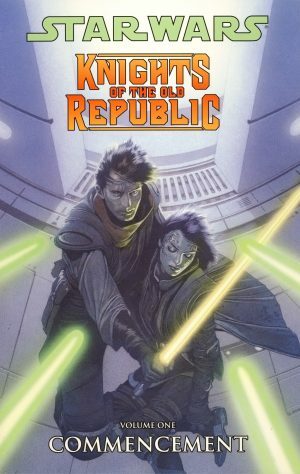 In the connected volumes 1-9 of Knights of the Old Republic, Zayne Carrick began as a Jedi trainee, but his experiences taught him Jedi training wasn’t for him. He’s attuned to the force, but in an unrefined manner. He finished Demon deciding to forge his own path, and John Jackson Miller picks up on him among the troops in close combat. It’s unconvincing. Zayne as a likeable guy on the run trying to clear his name produced a series of entertaining graphic novels. 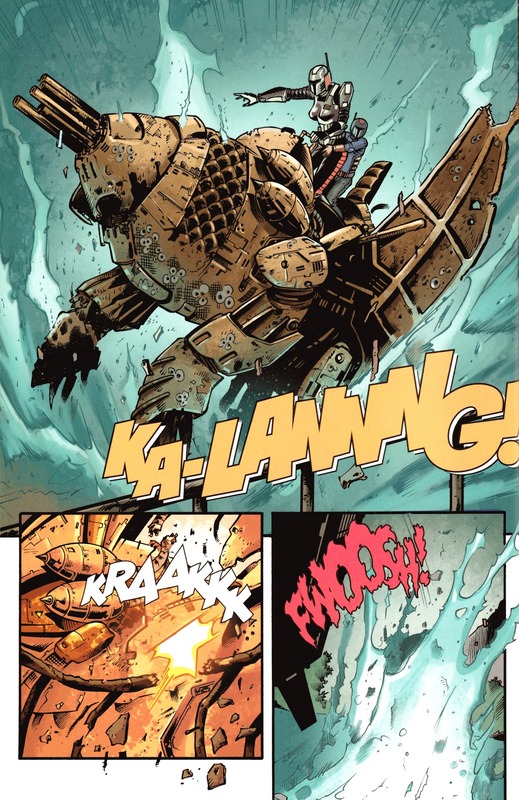 Zayne as a confused, whiny guy on the front line attempting to save everyone he comes into contact with isn’t credible, even taking into account that he can make what seems bad luck work in his favour (in essence). Despite his personal code against killing anyone, Zayne has deliberately placed himself in an arena where that’s almost essential, and as he has no suicide wish, it never convinces. This is despite Miller accentuating the compromises Zayne makes to maintain his code, compromises most would see as traitorous. He’s not the only one. 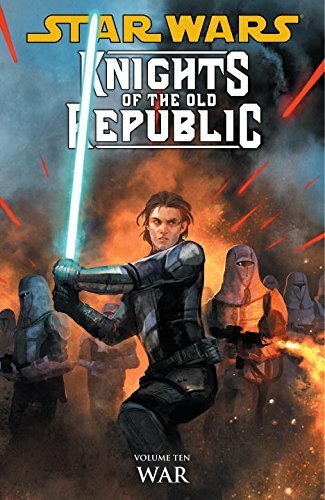 Throughout Knights of the Old Republic, it’s been taken for granted that committed Jedi use their talents on the Republic’s behalf. That’s not the case in War, but again, the ideology and motivations of the rogue Jedi can’t withstand much scrutiny before gaping plot holes manifest. 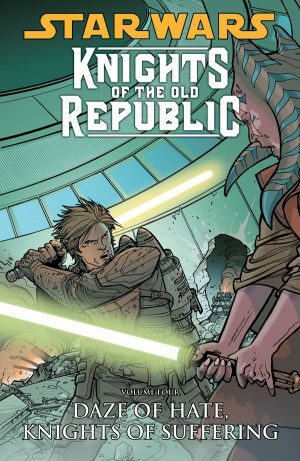 The really good plot thread is what Miller does with Morvis, the Republic commander seen in the opening scenes. He undergoes quite the journey, in which what seemed an unshakeable attitude is gradually transformed. The constant conflict and combat arenas call for an artist not working in a pretty style, and the looseness of Andrea Mutti’s work and the way he creates wasted environments are ideal for War. These are devastated locations, littered with dirt and debris, and there’s no gleaming, polished armour to be seen, it’s all dented and stained. He has a fair number of a new characters to create, and these all have personality. If you’re able to overlook the underlying plot motivation not gluing together as it should, then Miller and Mutti deliver a tense story, although without the big twists present in Miller’s earlier work. 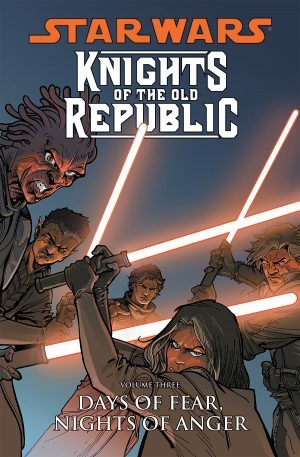 It’s also found as part of Star Wars Omnibus: Knights of the Old Republic volume three.